Here you will find a few exclusive items that can only otherwise be purchased through select retailers on the high-street. They are unique, rare and make wonderful gifts. 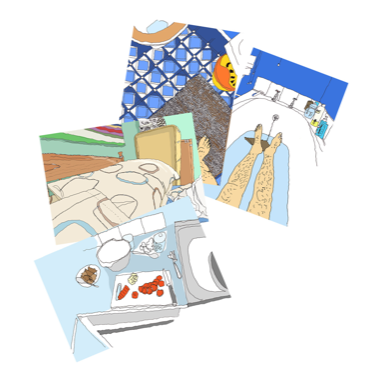 A 4×6" greeting card in a choice of designs from the 'Flat Life' series. 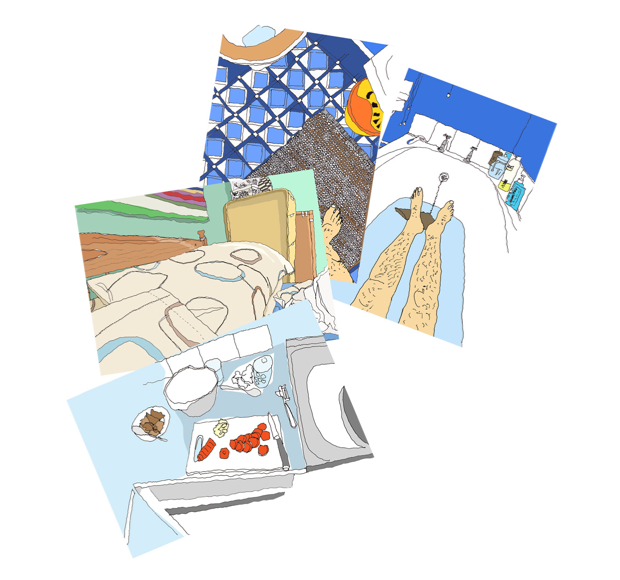 These gorgeous, striking designs are taken from the 'Flat Life' series. Each card has a smart matt finish and is left blank for your message. Each card comes complete with a white envelope and is sealed in a cellophane wrapper. Designs can be viewed on the 'Flat Life' page of this site. 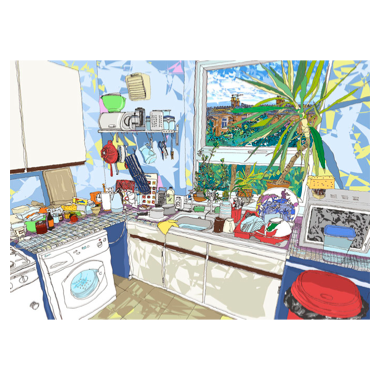 A special edition glossy card with the impressive 'Kitchen' illustration. This is a special edition card with a beautiful glossy finish. 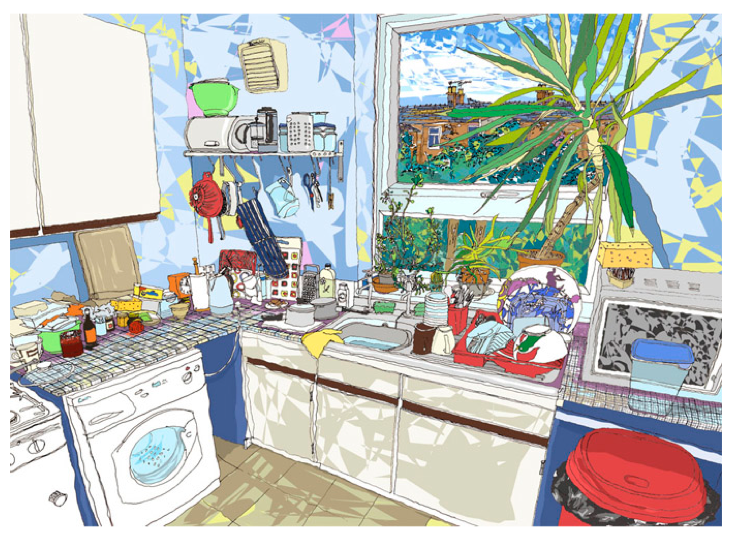 It measures 210×150mm and features the impressively detailed, and fascinating, 'Kitchen' illustration. The card is left blank inside for your message. It comes complete with a white envelope and is sealed in a cellophane wrapper. The 'Kitchen' design can be viewed on the 'Flat Life' page of this site. 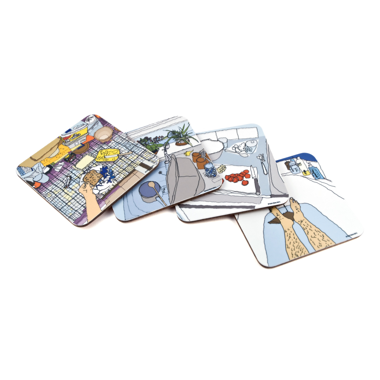 A delightful set of four high quality melamine coasters. 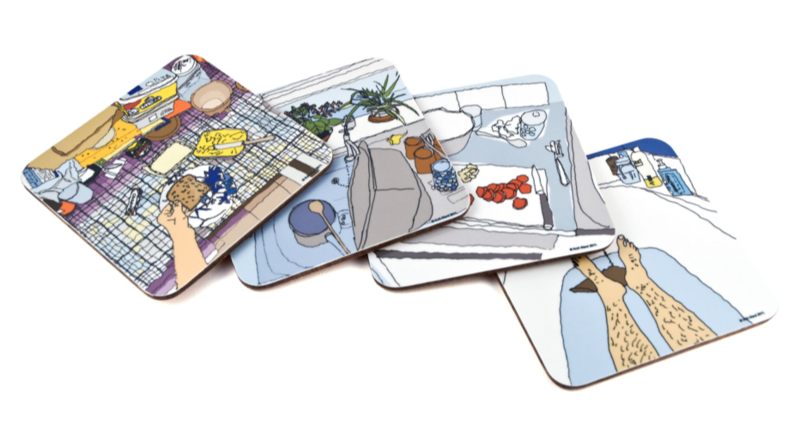 A delightful set of 4 coasters featuring the following four illustrations from the popular 'Flat Life' series: Kitchen Sink, Carrots, Toast & Butter and Feet in the Bath! They are made in the U.K. from high quality melamine and are beautifully finished with a thick quality cork backing. Each set is presented in its own clear wallet and the fascinating designs are sure to be a talking point in any home! Further images of these coasters can be viewed on the 'Flat Life' page of this site. Postage is calculated at the secure Paypal checkout.